This unique Bed and Breakfast is an idyllic retreat, offering luxurious accommodation and excellent personal service, with the added bonus of breath taking sea views. Cliff Lodge Guesthouse is the ideal choice for those looking for an intimate, relaxed atmosphere with all the comforts of a boutique hotel. 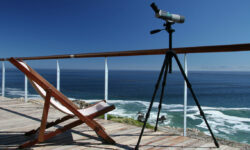 The five luxurious B&B rooms have ocean views, satellite television, sea facing patios and all comforts. Rooms range from standard sea view, to spacious sea front, and a luxurious suite. Cliff Lodge sea view guest lounge has a fire place for chilly nights, an all weather sea-front conservatory and a spacious balcony overlooking the sea. There is an ocean front swimming pool, and the sandstone pool deck has comfortable loungers – the perfect place to unwind and relax!. De Kelders is near Gansbaai, 30km from Hermanus, on the Cape South Coast, just 160km from Cape Town. 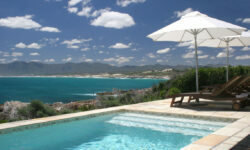 Perfect area for white beaches, horse riding, golf courses, wine farms and many other attractions. It is also the best place in South Africa to experience the ultimate sea safari. The wild, beautiful ocean of Walker Bay offers a unique eco-experience – this is truly the Kruger National Park of marine tourist attractions in South Africa! A variety of Whales, Great White Sharks, Cape fur Seals, dolphins, and extensive bird and fish populations thrive in these waters. De Kelders is the Whale watching mecca of the Western Cape, and has what is arguably the best land based whale watching in the world. Nearby Gansbaai is the best place to cage dive with and view Great White Sharks. 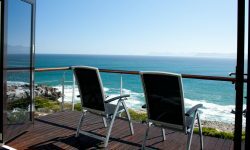 From Cliff Lodge, enjoy a walk to the nearby secluded beach, swim in the ocean or sea front pool or relax with our fantastic cappuccinos while whale watching from the deck.